Sunday Talk – BACK BY POPULAR DEMAND!! Just to let you all know that our Suday gathering is back on the agenda. Starting with Sunday 3 Rabeeă al-awal 1440 ( 11 November 2018 ). The objective of this COM’s family gathering is for us to get to know one another and maybe benefit from a light reminder from the teachings of our most beloved prophet Muhhammad (صلى الله عليه وسلم). As a bonus we may sometimes invite a visiting speaker. For this 1st gathering we managed to book our brother shaikh Abu Sohaib as our first guest speaker. The shaikh needs to leave us by 3:30 at the latest. So we need to start his talk by 2:15 or as soon as he arrives. So please do arrive by 2pm. So please free yourself and your family for that afternoon. If you have guests for that Sunday then please invite them in to join us too. Our gatherings are open for all. Looking forward to seeing you inshaaAllah. Just a few words about Ramadaan: we start and finish Ramadan in sync with Makka. so Tuesday will be 29 Sha’baan, thus Ramadan may start Wednesday, or Thursday if Sha’baan complete 30 days. depending on new Crescent sightings.  About 6:30pm (our time) they would be praying Isha in Makkaht مكة المكرمة. So on Tuesday please go on the internet watching Makkah life. If after Isha they pray Taraweeh then we know that fasting starts Wednesday, otherwise it’ll start Thursday. We have booked the hall at Thomas Wall Centre from 10:30 to 12:00 midnight. We (إن شاء الله ) shall start on Tuesday. If RAMADAN is on Wednesday then we pray Taraweeh, otherwise if starts on Thursday then we just pray Isha. – congregation prayer shall start at 10:45 pm. – If you would like to help preparing the hall laying down the prayer Matt’s etc then please arrive at 10:30 Sharp. – PLEASE bring your own drinking water with you. there is free fresh drinking water tap at the hall. – please park your car in the centre’s car park. But leave the end three spaces by the tree for disabled parking. – if the car park is full then please park on the main road (Ben hill Ave). or the roads opposite the centre. – please do not park on the the road adjacent (Lenham Road). – if you want to chat to your friends then please do it inside the hall, or inside your car, but not in the car park as this may disturb the neighbors or the residents of the centre. The hall will be open at 10:30 for 10:45 start. If you would like to volunteer sharing the duties of opening the hall etc then please contact br Mohammad Kabeer who will put you on the Rota. Quran Memorisation Class – FREE! Now that the summer is over and we have celebrated the Eid, it’s time for our classes at the Civic Offices to resume. We will be honoured by a special course from Dr Islam on memorising the Qur’an with understanding. The classes will be on Friday evenings 7pm to 9.30pm, starting this Friday 8 September, and Wednesday evenings 7.30pm to 9.30pm starting next Wednesday 13 September. Dr Islam taught a part of this course at Markfield this year and I’m sure all would agree that it was very beneficial – however even those who attended Markfield are encouraged to come as more surahs will be covered insha Allah. And the Monday brothers tajweed class will resume this coming Monday 11 September, at 7.30pm insha Allah. – Arrive by 9 – 9.30am latest, the Salaah will start at 10.30am sharp. There will be plenty of parking but please arrive early to avoid the rush. – Bring your children, wives, sisters, brothers, parents in fact all your family! As MC of the event it’s important you know if you’re bringing food I like anything with lamb!! 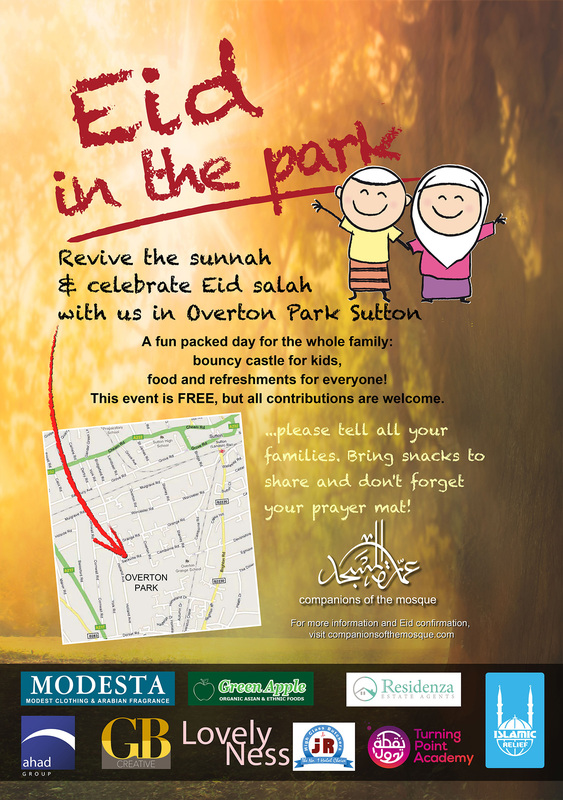 Just to let you all know we are in the final stages of organising our 7th Eid in the Park event in Sutton. There is a lot going on behind the scenes, but there is still a lot to do. We are looking for at least volunteers that can help on the actual Eid day, i.e. setting up the park at 7:00am, traffic control, helping with food, clearing up after the Eid. Companions of the Mosque will be organising Eid gathering in the park for the family for the 7th consecutive year! Date to be confirmed – please watch this site on the 25 June 2017 after 6pm for Eid confirmation. Please arrive by 9.00am for the salah at 10:30am sharp – arrive at the park early to avoid any delays. There will be separate areas for the sisters. Just another reminder, we have a special friend of COM visiting us today for the classes at the Civic offices: Shaikh Wasim Kimspon. For those who don’t know him, he has been a part of COM for the last 10 years, and although we don’t see him much now, he is prolific in delivering dawah in various communities and the inter-web… probably why we don’t see him much! Please come if you can.